Deputy Prime Minister Pham Gia Khiem has applauded US General Electrics efforts and long-term plans in Viet Nam. The Deputy PM, who doubles as Foreign Minister, had separate meetings with GE’s Senior Vice President Brackett Denniston and the Vice President and Senior Counsel of International Law and Policy, Karan K. Bhatia, in Ha Noi on May 26. The senior leader and GE officials discussed cooperation between Viet Nam and GE and other issues of common concern. 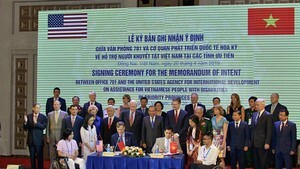 Deputy PM Khiem praised Vice President Bhatia’s contributions to Vietnam-US bilateral relations, particularly when the vice president worked as US deputy trade representative in 2005. Bhatia chaired Vietnam-US negotiations and signed a bilateral agreement for Vietnam to join the World Trade Organisation. He also led a campaign for Permanent Normal Trade Relations (PNTR) status for Viet Nam and signed a framework agreement on trade and investment between the two countries.